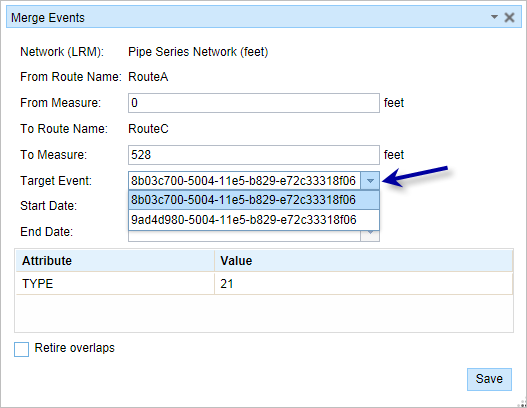 You can merge two or more line events using the Merge Events tool available in the Event Editor or through the attribute table. Upon successful execution, the Merge Events tool merges multiple adjoining events into an existing target event. All the input events, except the target event, retire. The merged event acquires the lowest value from the From Measure field and highest value of the To Measure field from the input events by default. If a gap exists between the input events, the gap is bridged in the merged event. You can edit the attributes of the merged layer prior to committing the merge. 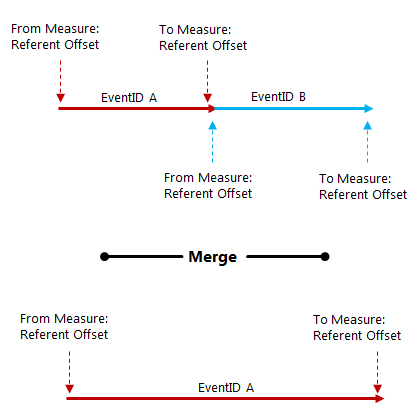 In the following image, if two events are merging and the From Measure of the starting event (EventId A) and the To Measure of the ending event (EventId B) have referent offset values, the resulting merged event (event A) will retain the referent offset values as its From Measure and To Measure. Use the following steps to merge events in the Event Editor. In the Edit Events group, click the Merge Events button . The Merge Events widget appears. Select the events on the map by drawing a bounding box. The events to be merged belong to the event layer selected in the Layer drop-down list. The event's attribute table opens at the bottom with the selected events highlighted in green. The participating events's EventID is listed in the Target Event drop-down list. Optionally change the From Measure, To Measure, Start Date, and End Date values. The start date defaults to today's date. All the records highlighted in green will be merged to the target event. Optionally edit the characteristic attributes in the table. The attributes are from the Target Event by default. Click Save to merge the records. You can also merge events using the records present in the attribute table using the following steps. 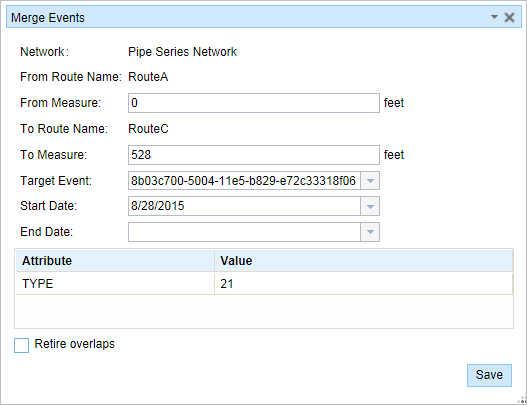 Select events using selection tools such as Select by Route, Select by Polygon, Select by attributes, and so forth. The attribute table opens with the results. Highlight the events you want to merge by clicking them in the table and pressing and holding the Shift key. The selected rows are highlighted in blue. Click the Merge Events button . The events records to be merged are highlighted in green. The Merge Events dialog box appears. You already have a lock in the current version on the route on which the event lies. The route on which the event is located is already locked by you but on a different version.